Wait No More: Clark Park "A" re-opens tonight! Since September, West Philly residents and city-wide fans of the bountiful farmers market have been awaiting the re-opening of Clark Park. Finally, the renovations are complete in the park’s section bordering Baltimore Ave (known as “A” park). The fence will come down, welcoming visitors to frolic in the new space amongst freshly grown grass. The project was originally slated for completion in November of 2010, but the meager, two-month time frame proved too short for completing the changes. 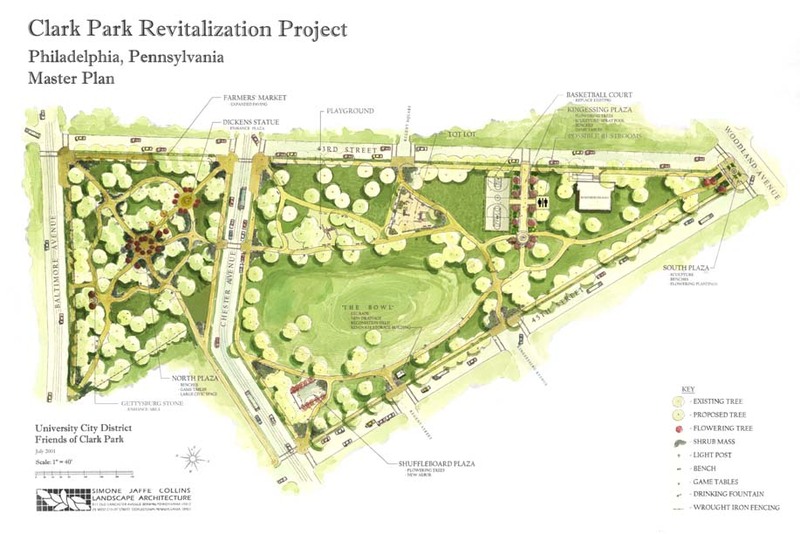 Modifications include, increased lighting, improved paved paths, and plenty of lush, grassy areas perfect for picnicking and lazy Sunday napping. Other improvements include more recycling receptacles, and several sets of tables and chairs for the Park’s Central Plaza. Environmental concerns were also taken into account as the park underwent its makeover. Many of the lampposts are powered by GFCI (ground-fault circuit interrupter) outlets, which monitor the amount of electricity flowing in a circuit, and trips the circuit should an a potentially hazardous (shock, fire, etc.) current be detected. GFCI’s also negate the need for using noisy generators to power large events the park hosts. Another cool techie tool used in renovation was a machine called an Aero-Vator, which is able to loosen soil without disturbing the roots of the park’s many ancient trees. As with any much-anticipated homecoming, a party will be thrown this evening to welcome back “A” park. Deputy Mayor Michael DiBeradinis will host, along with other state officials, and community partners. The festivities will kick off at 4:00 p.m. (skip out of work early! ), and include “A Taste of the Market” – a delectable sampling of the farmers market’s offerings. Opening party details after the jump!